Rich Tandler of CSN Mid-Atlantic has reported that the Washington Redskins third-round cornerback Fabian Moreau will start Redskins camp on the active list. Moreau missed the entire offseason program due to the torn pectoral muscle he suffered during his pro day. Moreau will now compete with second-year cornerback Kendall Fuller. 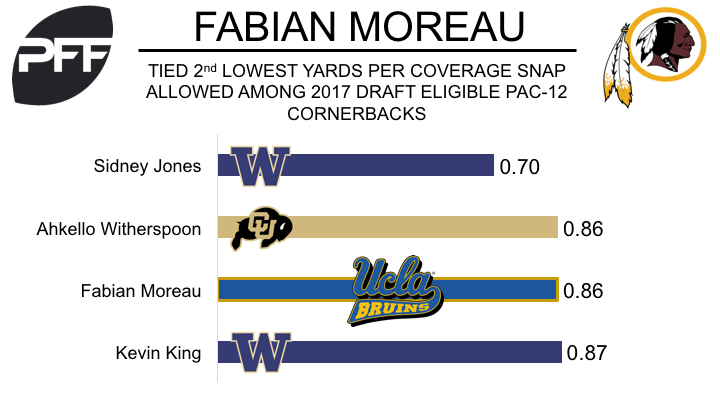 Moreau performed well in coverage in 2016, and allowed just 0.86 yards per cover snap, ranking second among all draft-eligible Pac-12 cornerbacks. He allowed a reception for every 13.6 coverage snaps, which ranked fourth. Moreau allowed a passer rating of 67.2 when the ball was thrown into his primary coverage, ranking him fifth among draft-eligible Pac-12 CBs, and he defended 15 percent of the passes thrown his way. Moreau ended his career at UCLA with a PFF overall grade of 77.5, which ranked 95th of 269 college cornerbacks.